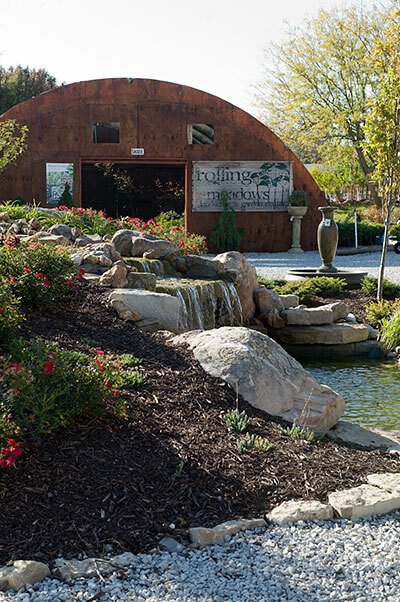 Rolling Meadows Landscape and Garden Center is a full-service company that not only sells beautiful and functional horticultural products but designs and installs living landscapes with a focus on quality and creativity. The Garden Design & Retail Center is a new concept that we were thrilled about opening in Spring 2011. After working in landscape and design for over 15 years, we were excited to expand our love of people and design into the garden center space, which not only offers beautiful and functional products and tools, but showcases design ideas and elements around the property to give you inspiration. Rolling Meadows offers retail delivery, plant installation, landscape design, landscape construction, outdoor living space design and installation, water feature design and installation, irrigation installation and design, consultation services, bulk mulch and topsoil, children's play area design and installation and much, much more. We can service all your landscape and garden desires. Call us today to schedule your landscape consultation or stop by the Garden Center and talk to an experienced sale person about your latest project. Let us help you create the outdoor space that sets your property apart. Our goal is to provide you with a unique experience that offers a very family friendly feel. Be sure to sign up for our newsletter and follow us on Facebook, Twitter or Blog to learn about any upcoming events, seminars, classes, projects, special promotions and more. We look forward to working with you!